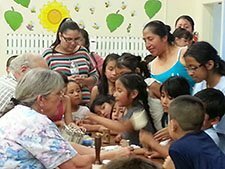 DOWNTOWN LANGUAGES is a 501 (c)(3) nonprofit organization dedicated to increasing opportunities for immigrants and building respect and understanding across cultures by providing language, literacy, and other educational programs. Do you shop at Amazon.com? Sign in to Amazon using this AmazonSmile link (http://smile.amazon.com/ch/20-0646954), and Amazon will donate 0.5% of the price of your eligible purchases to Downtown Languages. Bookmark it and use it every time!